Anwar al-Sadat, or Sadat, the Egyptian ex-president (1970 – 1981), was a complex personality, and his assessment is not easy. Locally, he was hailed by his cronies and subservient media as the “Hero of War and Peace” and the “Grandee of the Family”. Internationally his efforts to end the war situation with Israel and his signing of the Camp David Accords in 1978 and then the Egypt–Israel Peace Treaty in 1979 were appreciated by many world leaders, particularly in the West. For the Copts he is held responsible for introducing Islam into politics for the first time in Egypt’s modern history since Muhammad Ali (1805 – 1848) started the first step in modernising and secularising Egypt. Islam had been used prior to Sadat in politics, and even during Egypt’s Liberal Period (1922 – 1952), particularly at parliamentarian elections, but never before had Islam been employed by the state, and by its head, in such a way and to that degree. 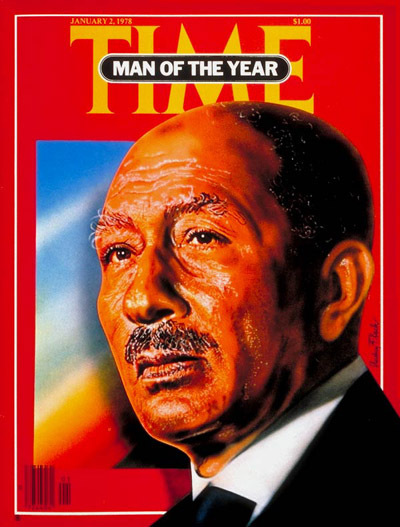 Sadat called himself the “Believing President” and “Man of Science and Faith”, and enshrined Sharia in Egyptian Constitution, first as one of the sources of legislation and later as the principal source of legislation, thereby ending Nasser’s secularism. Since then a bone of contention has been introduced into Egypt’s political and social life, upon which Egyptians bitterly divided. From that time on, the jinni of political Islam has been unleashed by the state, resulting in all the mess which Egypt is witnessing now. But nothing exposes Sadat’s Islamist tendencies as the talk he gave to the Egyptian Parliament on 14 May 1980 in which he addressed Pope Shenouda, the spiritual leader of the Coptic Orthodox Church, who was protesting the increasing Islamisation of Egypt and the restrictions on the religious liberties of the Copts, saying: “The Pope must understand that I am a Muslim President of a Muslim State.”[i] Prior to that, Egypt’s rulers carefully tried to represent themselves as protectors of Egyptians, Muslim and Christian alike, on equal basis, even though their reality did not always match their rhetoric. With Sadat we have the first Egyptian ruler since the close of the eighteenth century publically announcing that Egypt is for the Muslims, for that was what it really meant. Imagine Lyndon Johnson, for example, addressing Martin Luther King, and through him the Blacks of America, saying: “I am the White President of a White country.” What would that mean? And what sort of message would that convey to the Blacks? It would mean that the U.S. is for Whites only; that its White president represents, works and defends Whites only; that Blacks are at best second-class citizens; that Blacks should only beg for ‘rights’ politely and be given them by Whites as a matter of benevolence. That is indeed the message which the Copts received from Sadat: Copts are not equal to Muslims and they should not expect the same rights and protection from a state which is not theirs, for Egypt is a Muslim state – which means that Egypt belongs to the Muslims only. This was a new rhetoric which had previously been used primarily by Egypt’s Muslim Brethren and Salafists. Throughout his life, Sadat used Islam to stay in power and get the support of Egyptian masses. While the West, for good reasons, thanked him for his leadership in ending the war with Israel, he was very exposed for the Copts, who knew his duplicitous nature, even though they supported his peace-making with Israel to end unnecessary wars. For the Copts, Sadat was the first Islamist ruler in Egypt’s modern history. He took the first serious attempt in the dismantling of the state of citizenship in Egypt – the concept that all Egyptians are equal under the law. His regime was not secular – at best it can be described as Islamo-secular. This terminology seems to be an oxymoron, but in Egypt many oxymora bizarrely exist, for in Egypt everything is moronic when it comes to politics. And Sadat’s two successors, Mubarak (1981 – 2011) and Tantawi (2011 – ), seem to have inherited his Islamo-secularist idiosyncrasy, and hence all their problems. Now, the question which Coptic nationalists would like to ask current and future rulers of Egypt, including all those who contest for Egypt’s presidency, is this: Will you also be a Muslim president of a Muslim state or will you be an Egyptian president of a state that serves all Egyptians on equal basis and without regard to religion? Your answer, which we shall judge on your actions also, may decide the future of Egypt’s territorial integrity. Let us not beat around the bush. The only type of state in Egypt which will keep all Egyptians together is a secular state that pays no attention to one’s religion, and treats all Egyptians, whether Coptic or Muslim, as equal under the law. An Islamic state in Egypt leads only to its partition. [i] The exact words of Sadat in Arabic are: “إن البابا يجب أن يعلم أنني رئيس مسلم لدولة مسلمة.” These words Mohamed Hassanein Heikal translates in his book, Autumn of Fury, as, “The Pope must understand that I am the Muslim President of a Muslim country.” [Mohamed Heikal, Autumn of Fury, the Assassination of Sadat (London; Corgi Book; 1984); p. 228] This is not an accurate translation. The words should be translated as in the text of my article with an emphasis on the words “a Muslim State”, that is Egypt. ⲦⲤⲰⲦⲈⲘ ϦⲒⲚ ⲠⲀⲘⲀϢϪ. I hear you friend. A sad day that brought misery to the original inhabitants of the land. Secularism didn’t stop Nasser from oppressing, robbing, and exiling the Jews, Armenians, Greeks, Italians, Assyrians, etc. Surely it was no coincidence that most of those designated as foreigners were non-Muslim.